I was able to get out for a couple hours of fishing today so I decided to try a Lake Saint Clair access point by my house called Brandenburg park. The park is located in New Baltimore, MI and is a good spot to fish all year round. The park has a dock for shore fisherman and also a couple spots to launch a boat. The charge is three dollars to park but during the hard water season you can usually park for free because the gate is unmanned. I arrived at the park around 3 pm and quickly unloaded my gear from my car. It is nice because the parking spots are close to the launch point. 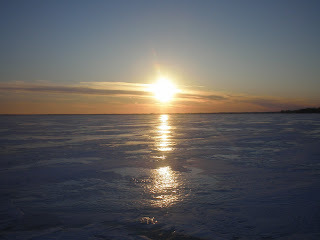 I was on the ice within minutes ready to make my trek onto the frozen lake. I walked straight out from the launch about a half mile before I decided to stop and set up shop. I drilled two holes with my laser auger and was ready to drop a lure and get to the fishing. I always like to start with a bigger lure when ice fishing. I put a red jensen egg on the bottom of a white Jigging Rap and hoped for the best. I jigged for 15 minutes changing up speeds and lures without seeing a single perch. Because of the inactivity, I decided to move to another spot. I had been jigging aggressively and didn't bring in any fish in so I headed for deeper water. 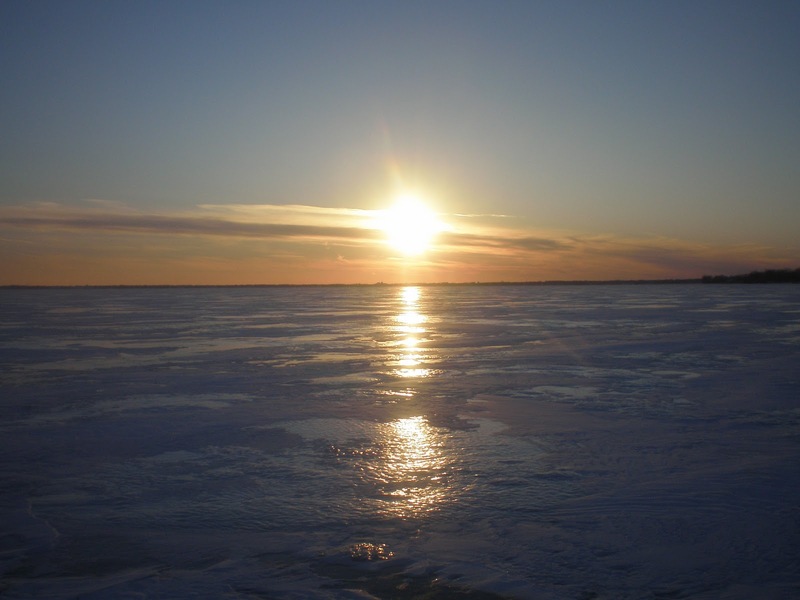 I walked another quarter-mile out on the lake and drilled a hole. Before starting to fish, I took a second to take a look around the lake and take in the view. I was 3/4 of a mile out from land sitting on a frozen ice cube and was loving every second of it. The only thing better would be to catch some fish. I tossed my jigging rap down the hole and within seconds had a 10 inch perch on the ice. I popped the treble hook out of its mouth and tossed my lure back into the hole. I looked down to the bottom of the lake and saw a couple more keeper perch in the hole. I jigged my Rapala in front of them but they would not bite. I decided to change my lure to a Northland Bro bug and that triggered another keeper to bite. I iced the fish and continued to jig. The bite died off when a school of small perch moved in. I played keep away with the small ones for awhile hoping some big fish would move in. That did not happen so I decided to move again. I packed up my gear in my shanty and pulled it all further out on the lake. I made my way out to the first pressure crack and drilled some more holes. I don't know if it was because I was so close to the pressure crack but the ice was really popping and cracking. I guarantee a person with less experience would have packed it up and headed home but I sat there and continued to fish. The ice was so loud when it cracked it sounded like thunder. I saw quite a few small perch and a bunch of shad swimming in the hole so I started jigging the Rapala again hoping some big ones would come in. The small fish were aggressive so I had to work harder at playing keep away from them. After jigging my lure away from the small ones for awhile, some jumbos moved in to view and they were aggressive. I hooked two fish but lost both at the top of the hole but did end up landing two more keepers. I saw at least ten more big fish down in the hole but they would not commit to bite. They would follow my lure up to the hole but would not take the bait. 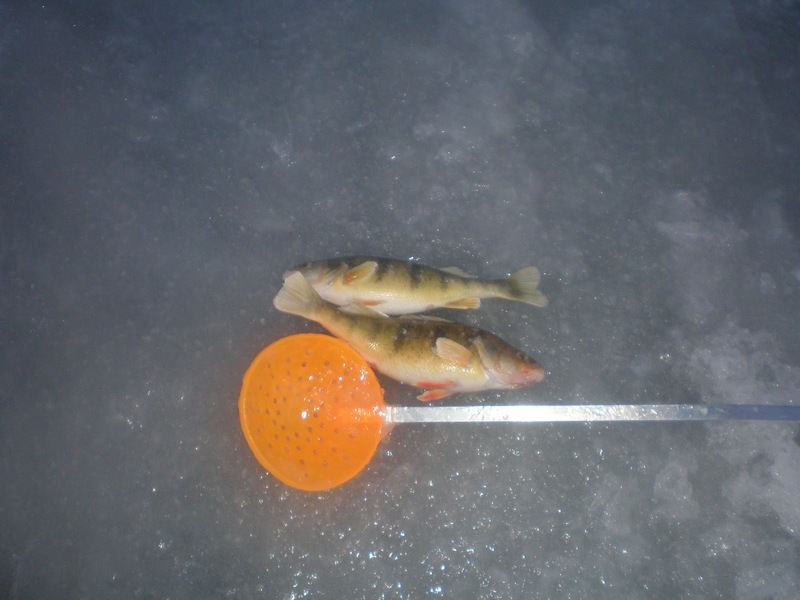 I wish I would have set up my spearing hole because I could have had at least a couple more in the bucket. That flurry of activity lasted for about 20 minutes and then the bite died down. The sun was starting to set and it was getting harder to see down the hole. I popped the top on my one man flip up and decided to jig for a couple of more minutes hoping a bonus walleye or pike would come by right before dark. I didn't get another bite but I was able to take in a beautiful sunset before I headed back to my vehicle. This trip was like most experiences I have on Lake Saint Clair. I didn't hammer the big perch but I brought home enough fish for a meal and also some great memories. I had a good experience here but in early summer i took out some bass worms watermelon color with red specks put them in a Texas rig and I let them sit there in the water about 20 yards out from the pier and within a minute I caught a 2 pound 16 in ch large mouth and he gave a fight. Within another 5 minutes I did the same thing and just let the worm sit on the bottom and I caught a 12 inch large mouth and then I packed up after that because it was starting to get a little bit dark it was about 8:30 when I packed up. All in all a very good fishing spot and very local too. it is a nice park. I just went a few weeks ago and caught a bunch of bluegills with my 2 year old. Thanks for the comment!